Catering: What Food Should You Offer? Home > Starting Up > Catering: What Food Should You Offer? 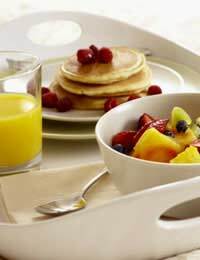 Breakfast is obviously at the heart of a bed and breakfast establishment but these days you need to be catering for the myriad fad diets, food intolerances and differing tastes out there. To some extent, what you offer for breakfast is going to depend on the size of your B & B, your target market and your location. Any B & B worth it's salt will be catering for the traditional full English breakfast, of course, but anyone who relies on that and has no other choice to offer customers will go out of business very quickly. It helps if you ask customers when they book if they have any special dietary requirement and then you can make sure that you can get the relevant food in to cater for them in advance. Not many people in the United Kingdom these days are normally cooking breakfasts for themselves so they are less likely to do it on holiday. So it's important to offer other breakfast staples such as cereals with a choice of milk, full fat, semi-skimmed and skimmed. Put that together with bread or toast and the usual jams, marmalades and honey, and this range of food will probably cater for the majority of customers from the UK. If you are in an area likely to have foreign customers then it makes sense to be catering for continental breakfast options. This will give you quite a few choices that will cater for special food diets too. Make sure you're also offering teas, coffee and fruit juices. Continental breakfasts usually involve a selection of rolls and breads, perhaps croissants or Danish pastries. Add to this yoghurts and fresh fruit, eggs and possibly cheese and cold meats too if you want to go the whole hog. It's simpler to put out as there's no cooking involved. Some of the food options now on the table will give a good choice for vegetarians although vegans may prove more problematic. This is all starting to get expensive, particularly if you have to offer all of that up for just two guests, and they end up having full English instead. Food regulations won’t allow you to pick it all up and put it down for tomorrow's customers either. Although some customers won’t like it, you can cut down the waste by asking customers for their choice the night before. It might help if you emphasise that it's all fresh so it helps if you know in advance as it will be quicker to prepare their food. Should You Offer the Choice of Evening Meals Too? Many B& B's now offer evening meals as well as breakfasts. This does put an extra burden on the owners as there's more catering involved. Sometimes it's inevitable, if a B & B is very isolated then you'll have to be catering for evening meals. Similarly if someone is visiting with an eating disorder or intolerance, if they know that you are catering for that it will make them more relaxed and they’ll enjoy their stay more. But most B & B owners, particularly those in tourist locations, will have a choice of pubs, restaurants and other hotels nearby. This will make it easy for customers to find a choice of evening meals and lighten the catering burden on the owners too. One thing that might be worth considering in today's environment is to offer fully organic food, and locally sourced too, if that's workable. With the emphasis on the environment and healthy eating this could well pay dividends with discerning customers. Unfortunately we cannot make individual recommendations but if anyonereading this knows of anyone, they may be able to post their details.